Robert Flynn from Solarbarn explains how to choose a solar array to suit your needs. After spending 25 years in the IT industry, Robert had a change of career and set up Solarbarn. It was 2010 and at a time when the government introduced the feed-in tariff scheme which kick-started the whole industry. While we have spoken on the podcast before about solar PV, we haven't discussed what is required for the installation process. 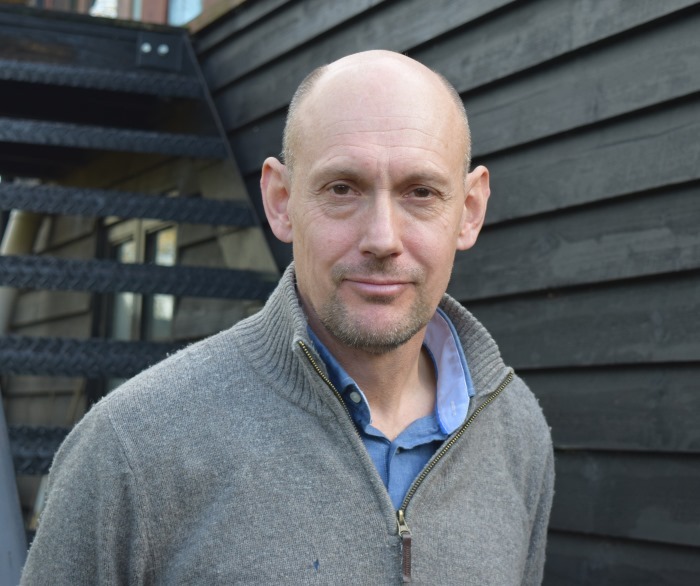 As we have been following Solarbarn's installation at Buckinghamshire Passivhaus, our video case study in The Hub, we thought we would speak to Robert to give us an idea of what you'll need to think about if you're planning to install solar PVs. How many panels you need will depend on your roof area, how much energy you want to produce, and how much you are prepared to pay. According to Robert, you can't really have too big a system. A large system may well produce more electricity than you need at a particular time, ie during the summer, but any surplus isn't wasted as it is simply fed back into the distribution network to be used by others. A standard solar panel is now 300 watts, but you can get 360 watt panels if you want to pay extra for a more efficient product. Robert suggests if you have a large roof you don't need to pay for the more expensive panels, as you have the space to install more of the cheaper, 300 watt panels. He says the pricier 360 watt panels are really only necessary where you have a small roof and typical sized panels aren't going to give you the power you need. A south facing array will produce more killowatt hours in a year than an array pointing east or west, or south-east or south-west. The shallower the pitch, the less of an issue orientation is. For example, with a shallow, 20 degree pitch, the panels are closer to pointing up in the air than at the horizon. A 45 degree pitch will make a difference as it is pointing more to the horizon. So a 45 degree pitch east/west will produce probably 25% less than the same array on a south facing roof. In terms of consumption however, there can be benefits of going east/west. An east facing array will produce a little more in the morning, and a west facing array will produce a bit more in the afternoon than a south facing array. A south facing array will give you a bigger peak at midday, with perhaps less in the morning and afternoon. 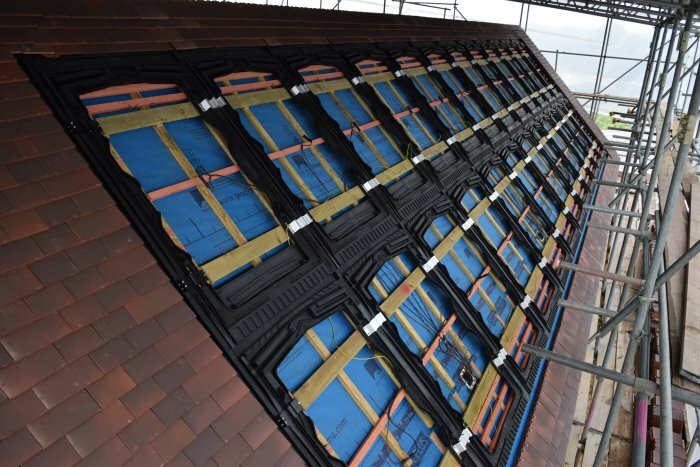 As Buckinghamshire Passivhaus is a new-build they have been able to do an in-roof installation. The solar panels are part of the roof so it ends up being tidier than a retrofit would be. 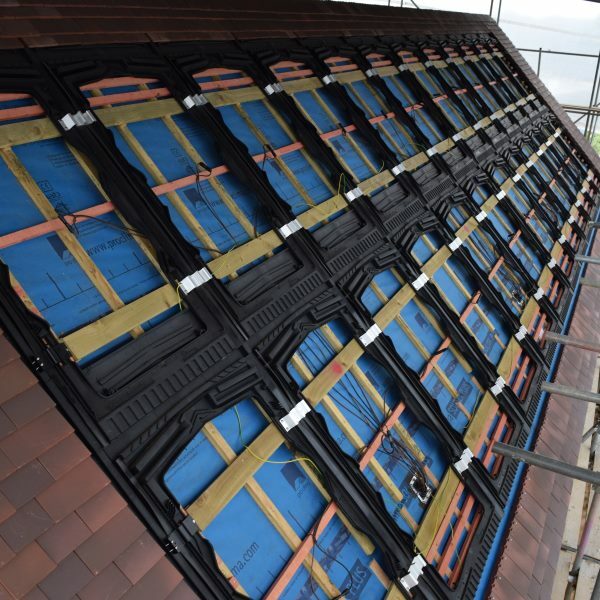 It also means you save on the cost of roof tiles as these are not required under the panels. The roof is built, felted and battened. At that stage Solarbarn would lay interlocking plastic flashing frames onto the battens which will ultimately hold the panels in place. The roofers return to tile the rest of the roof up to the flashing frames and making it watertight. The solar panels themselves aren't put in place until the roofers have finished their work, to make sure they are protected and aren't going to get damaged. At this installation the clients are using a power optimiser solution. A power optimiser on each solar panel means that the panels can work independently of each other, so if one is shaded for example, it wouldn't affect the output on any of the others, which on a traditional wired system can be an issue. The distribution network operators need to be notified of systems up to 4 kilowatts after they have been installed. 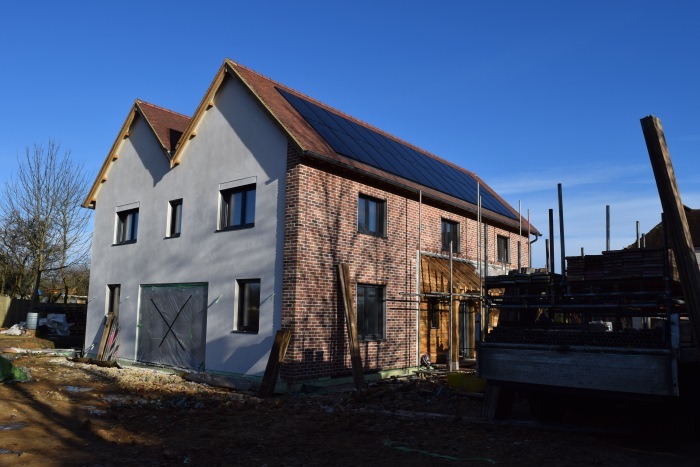 Anything over 4 kilowatts, as in the case of Buckinghamshire Passivhaus (7kW), needs to have their approval in advance as they need to be sure that the infrastructure is capable of taking the load when power is being injected back into the network. The solar array is first tested on a sunny day to make sure there is enough power going into all the panels and optimisers. The inverter is switched on and is paired with the optimisers at a safe 1 volt DC. When it is fully up and running it will be up to around 400 volts DC. The inverters get hot when producing a lot of power and eventually they will need replacing. They should last at least 5 years, and are usually guaranteed to last between 5 and 10 years. The inverter on the Buckinghamshire Passivhaus project is guaranteed for 12 years. A lot of customers of PV systems now have an immersion heater diverter, because in a lot of cases PV systems will produce a lot of energy when you don't need it. This channels any surplus power that would otherwise be exported, into your immersion heater. Robert doesn't feel that the economics of using batteries are quite right just yet, as they are expensive, don't store quite enough and don't last long enough. He does see a tipping point where improvement in battery technology plus escalating electricity prices will make batteries in solar PV installations a more feasible option. 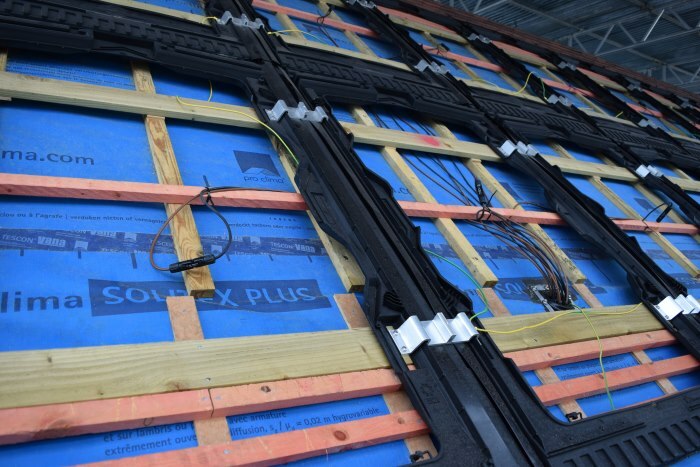 They have future-proofed Buckinghamshire Passivhaus by laying cables ready for batteries and technology to measure how much of the power they use and how much they export. By being able to measure their actual consumption they will be better placed when it comes to buying a battery array that is right for their needs. A solar panel pointing to the sun produces as much electricity on a frame in the ground as it does on the roof of a house, so space permitting, a ground installation might be an option. To make it worthwhile there usually needs to be a meaningful sized array, and for that size you will need to obtain planning consent. They need to be kept secure from children and animals endangering themselves, and also from theft. Typically, the ground arrays Solarbarn install for clients tend to be for large country houses that have swimming pools and huge oil consumption. 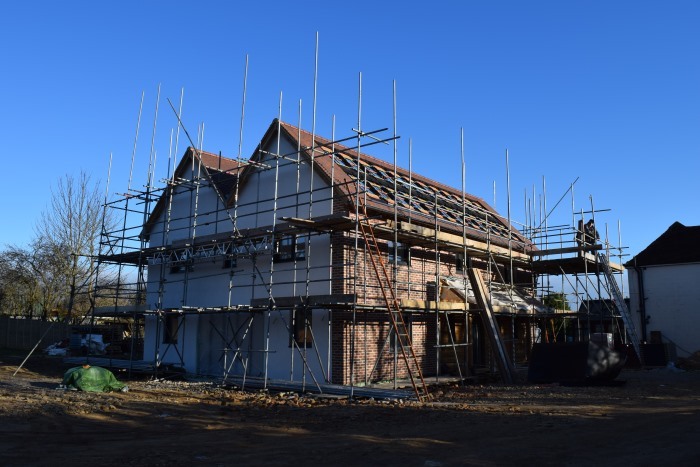 The benefits of installing a solar PV system at the time of building a house are that it is zero VAT (because it is a new build) and there are no scaffolding costs because the scaffolding is usually there already. Most of the work they do on new builds is now just considered an extra cost at the time of construction that will provide a huge ongoing benefit thereafter. For in depth videos following the progress of Buckinghamshire Passivhaus and other case studies you can join our members only area of The Hub. As well as step-by-step courses, you will also be able to join in with our monthly progress calls where members can share news of their self build projects and get advice from guest experts. Download a transcript of the interview with Robert Flynn.